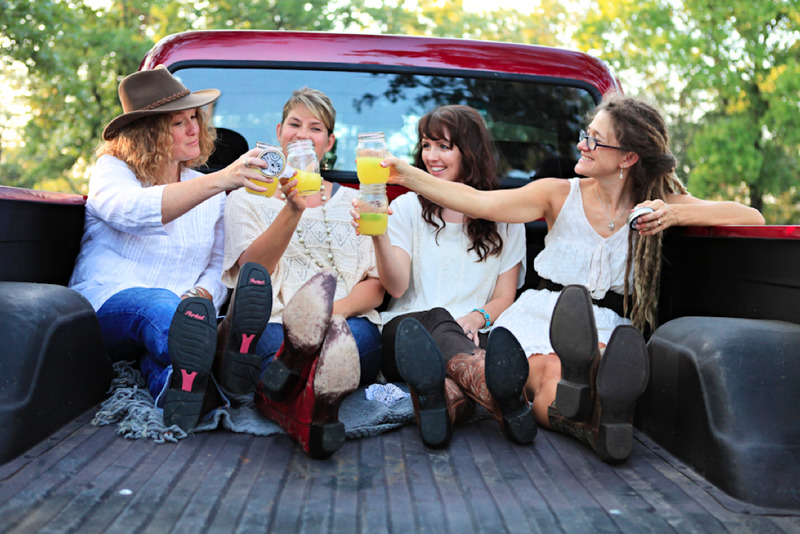 With its roots in Fayetteville, Arkansas, Country Outfitter is a subsidiary company of Acumen Brands Inc. The company was founded in 2010 by John James an innovator and a serial entrepreneur. In less than 12 months from its inception, Country Outfitter proved to be a social e-commerce giant by acquiring more than ten million social followers and email subscribers. In addition, the company was able to raise more than $100 million in venture capital in 2013. Details: Don't Miss Out! 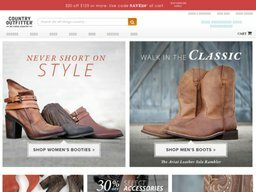 Get Up to 70% Off 300+ Styles of Boots. Details: New markdowns! Get up to 80% Off your purchase. With one of the best online infrastructures, Country Outfitter offers its online shoppers an easy to use shopping platform designed to mimic a physical store. Their products are displayed according to their category from new arrivals, men, women, kids, home, work and brand. Under each category is a variety of products to allow consumers the freedom of choice. Each of the products is displayed with its specifics and price attached to ensure that consumers make an informed decision. Country outfitters only ship to United States and Canada. If you like the website, why not invite your friends to join? The company offers an incentive to do so. If you invite someone who spends at least $99 on their order, then you will earn a $20 Country Outfitter online coupon code. It will automatically be credited to your account after 30 days of their purchase. Joining their newsletter is another good way to earn a Country Outfitter discount code at various times in the future. Newsletter members also receive news about upcoming products and other exclusive deals. Plenty of useful information can be found on the blog for those who'd like to check it out. The article topics range from fashion tips for women to how to clean exotic boots. At Country Outfitter you can find a variety of western inspired clothing and apparel ranging from women’s cow boy boots, men’s cowboy boots, Kid’s cowboy boots , cowboy hats, pants, jeans, shorts, jackets, belts, earrings, handbags, bracelets, watches, rings, necklaces, among others. You can also find popular brands such as ariat boots, Justin boots, Lucchese boots, Durango boots, Tony lama boots, Chippewa boots, Dickies, Wrangler jeans, Montana silver smiths and Carhartt. Their prices range from $19.95 to $1181.95 depending on the product type and category. Popular brands include Corral, Ariat, Justin, Lucchese, Durango, Dingo, Frye, Carhartt, Dan Post, Tony Lama, Laredo, and Old Gringo. Before you purchase Country Outfitters boots or other merchandise, make sure that you checkout their coupons section first. You can find great deals that will help save you some money. At Country Outfitter, payments can be made through American Express, Visa, Discover, MasterCard and PayPal. Fortunately, the process of redeeming Country Outfitters coupons is extremely easy. All you have to do is make note of the special code that you'll need to enter to take advantage of the deal. Once you're on the checkout page ready to pay, simply enter this code in the promo box to save money on your order. Country Outfitter currently only ships to the United States and US territories, as well as Canada, the latter which is charged a flat shipping fee of $24.99 and a 20% surcharge on top of the order total. Customers within the continental US receive free "saver" shipping on all orders, which takes 5 to 7 business days to arrive. You can also pay extra for Standard 3 to 5 business day shipping ($5.99), Two Day ($14.99) and One Day ($24.99). Other terms apply to other US territories so check out the website for a full breakdown. For unsatisfied customers, returns can be made within 30 days from the purchasing day for a 100% refund. However, the refund will not cover return shipping cost. The returned items should be in their original packaging with their UPC tags intact.